Recently, a senior executive told me that the single most important thing she has learned about being a leader has been to deal with conflict effectively. This woman has had a long career and participated in a plethora of leadership development programs over the years, so this comment was quite remarkable. Why would she see managing conflict as the most significant aspect of being a leader? I believe it is because conflict is a powerful force – it can destroy but it can also transform. Leaders who are able to minimize the destruction and harness the transformative power of conflict are able to bring tremendous value to themselves, their people and their organizations. I offer three tips for leaders in how to approach conflict and reap its benefits. Accept conflict as normal. Conflict is everywhere, and as much as we might find it unpleasant and difficult to deal with, no one can truly avoid conflict… at least not for long. At its core, conflict is a difference of some sort: a difference in values, understandings, wants, ideas, etc. When we perceive a difference as incompatible, we experience conflict. We then tend to attach emotions to the difference – the emotions can be “hot” (e.g., personal attacks and anger) or “cold” (e.g., refusing to speak). Whether these emotions emerge into the open or not, when we stick our heads in the sand and hope conflict goes away, it almost always does not. Instead, it grows and festers and becomes more destructive to relationships, teams and organizations. One of the first steps in handling conflict well is to accept it as a normal part of life, not an anomaly. Digging through emotions to identify underlying differences helps tremendously in viewing conflict as “it is what it is.” Human beings will always experience differences with each other, and that is okay. Learn and practice skills to manage conflict well. Conflict can feel scary when we do not know what to do with it. But there are very practical skills we can learn. 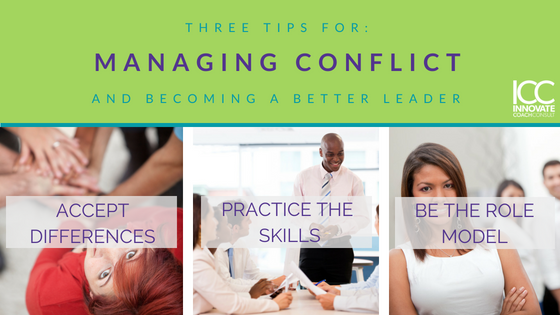 Numerous books, articles and training programs teach skills to manage conflict well. These skills include self-awareness and managing one’s own emotions to having difficult conversations and mediating conflict among others. It is critical to build your tool kit with approaches and techniques for dealing with conflict because every situation is unique, and different tools work better in different cases. When managed well, conflict becomes a positive force – working through it constructively builds trust and can bring people and teams closer together and actually improve and deepen relationships. In addition, teams and organizations can experience greater creativity and innovation as well as better decision making because they have processed through different opinions and perspectives. Serve as a role model. I can’t tell you the number of times I hear people criticize their leaders for failing to deal with difficult issues. By “difficult issues,” they undoubtedly mean some kind of conflict. When a leader avoids conflict, people take note and are likely to lose respect for that person. As a leader, it is important to demonstrate that you have the courage and the ability to face and work through challenging issues. Others will see what you do and how you handle situations in the face of conflict – in turn, that helps them to do the same. Don’t let conflict get the best of you. It is going to be a part of life and work no matter what. Shied away from or allowed to rage like a fire, conflict will destroy relationships, teams and organizations. But when it is embraced and dealt with effectively, conflict really does have a lot to offer. Make sure you are able to get the most of it.